Lexus 3 seater sofa is the ultimate comfort couch for your home and your tired back. The base of the sofa comes in a frame of engineered wood, while the seating and back cushions are equipped with webbing, S spring and pocket springs, as well as 28 kg per cubic meter foam density, making them super soft and bouncy. For the sleek and contemporary look, the genuine leather upholstery is given a mocha chocolate shade, keeping in mind the colour’s gorgeous appeal. But the best part of the sofa is its electrical reclining. The side seats of the sofa go into complete recline, while the thick armrests provide top-notch comfort. The middle seat can be turned upside down to access the cup holders, the device of which stays hidden behind the backrest of the middle seat. The sofa also comes with the console, USB and charge point. 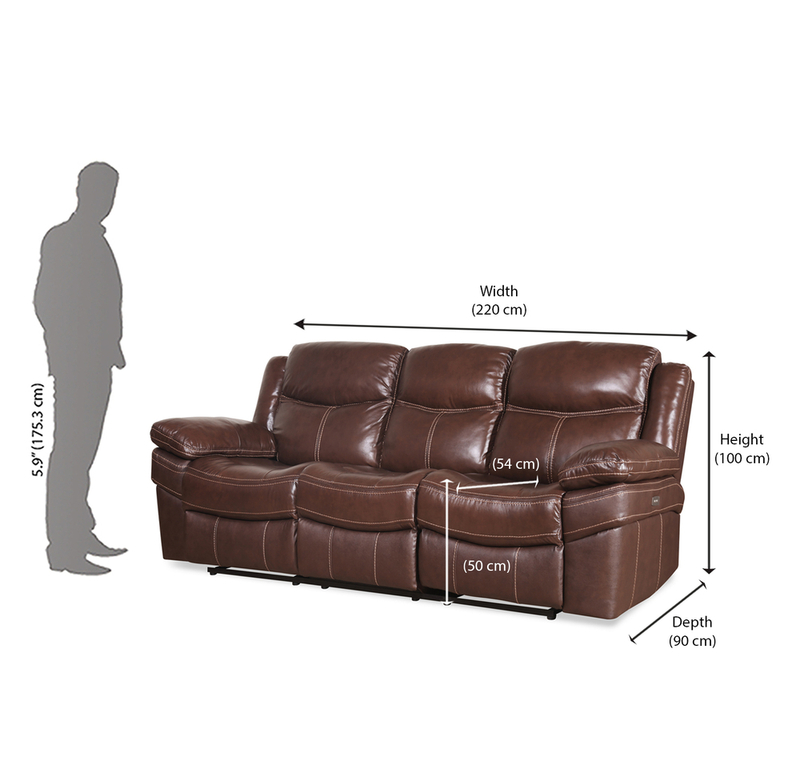 This 3 seater sofa with electric recliner will change the way you will look at living room comfort. When in couch position, it is like a very plush, modern set of 3 seater sofa. But once you need to put your feet up, it has got you covered with absolute efficiency. Get this piece of beauty from @Home. Electric Recliner that enhances the look of your living room.Leather on all boby touching parts.2 Seater with reading light, cup holder, storage compartment and extra storage drawer.Webbing & S Spring provides more comfort seating.